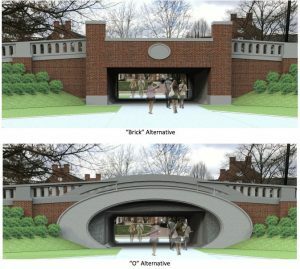 ATHENS — Two options for the look of a new pedestrian tunnel going under Richland Avenue were unveiled recently, and a poll on social media shows overwhelming support for one design. Underpass options. Images courtesy of the City of Athens. At a recent open house at Grover Center, Athens city officials showed a potential layout of the street near Porter Hall. Two photos showing the potential shape of the “underpass” – one a traditional brick square, and the other a rounded concrete design – were also displayed at the event. The project was introduced last September to the Athens City Council as a way to lessen the conflict between vehicular and pedestrian traffic along Richland Avenue, between West Green and the corridor between Grover Center and Porter Hall. The project will involve raising the street to make room for the new corridor. The cost was estimated to be $3 million in total, but city officials say a grant from the Ohio Department of Transportation will pay for most of the project. The city will be left with about $350,000 to $400,000, according to previous reporting by WOUB. Athens Mayor Steve Patterson hoped the open house would help anyone still wondering about the project understand the need for a new pedestrian option in that area. “There’s going to be a lot of questions and a lot of education as to how this is going to work,” Patterson said. When the project was introduced, Patterson said a study of the traffic in the area showed about 1,300 pedestrians per hour and 750 to 1,000 vehicles hourly. The City of Athens conducted a poll on Twitter pitting the two arch designs against each other. The “brick alternative” had 70 percent of the vote on Friday afternoon with almost 1,300 voters participating. Several said the brick alternative fit more with the aesthetics of Ohio University, and one person said the “O alternative” reminded them of logo for the University of Oregon rather than Ohio. The underpass is set to be completed by 2019.